In music, there are typically three components in the process. 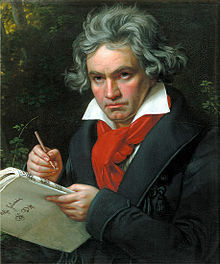 There is the composer, who does the inital and most creative part of the process. There is the musician, who learns the skill and art of playing their musical instrument, who practices and interprets the composer’s work. And there is the audience, awash in beauty and emotion, who get to enjoy the fruits of all this labor. In the realm of writing, I think writers do nearly two-thirds of those jobs. The writer is, in essence, both the composer and the musician. The writer is responsible for the creation of the work, for developing the skill and craft and art, and for the lion’s share of the interpretation of the themes and messages as well. The reader is allowed to simply be the audience- sit back, appreciate, enjoy. I think this analogy helps illustrate the reason that writers are now touring and social networking and blogging so much. It brings the performance aspect into the process. What audience would rather listen to a recording of Itzak Perlman or Lady Gaga (or both!?!) when given a chance to see them live? My goal, then, is to embrace my inner Perlman as well as my inner Beethoven. (Yes, I’m aiming a little high here.) May we all seek to compose something beautiful today, then peform the heck out of it tomorrow. I love this comparison (obviously) and I think that it is important to do as much as we can to get into the performance mode. A performance has such an amazing energy. It seems to me like it's also possible to see agents, editors, graphic designers, etc. as part of the orchestral performance of the book–I've taken to reading acknowledgements a lot more, and it strikes me how many authors feel indebted to all the other people whose input goes into the final polished book. (This isn't to devalue the role of author, only to acknowledge that other people also have a role to play here). I totally agree, Rosalyn! Excellent point. Tasha, I definitely have a lot to learn from you in the performance arena.